Bonnie Brock is a fourth-year medical student in the Doctor of Naturopathic Medicine program at the National University of Health Sciences (NUHS). Additionally, Bonnie serves as a student representative for Integrative Therapeutics, where she is an invaluable resource for fellow students, current professors, and medical professionals. 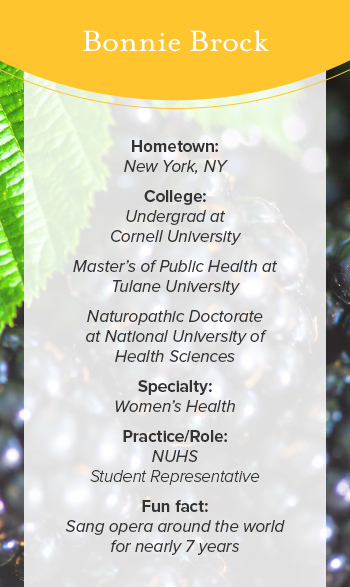 Her undergraduate degree in Nutritional Science from Cornell University and her Master's of Public Health degree from Tulane University sparked her knowledge and expertise in the field of nutritional therapeutics. Question: How did you get to be a medical student, why are you here today in the program? Bonnie: I have a fairly traditional allopathic medical background. I did my undergraduate at Cornell University with the intention of eventually going to a traditional medical school. Instead of jumping right from undergraduate to medical school, I wanted to get some clinical experience. So I went to get a master’s of public health and tropical medicine at Tulane University in New Orleans. During that time, I also became a registered dietician (RD). What challenges did you run into during your clinical experience? While I was working in New Orleans, I was trying to change personal attitudes and relationships with food, while also not disrespecting the fact that food is a massive part of the local culture. I remember one instance where I had a 60 year old patient who just had a triple bypass and she was very scared for her health and her future. I had spent a lot of time with her working on new diet plans and I really was hopeful because she wanted to change her lifestyle. The next Friday, I walked into her room to see her and her family sitting and indulging in an enormous bucket of every fried food you could imagine. Not exactly on the diet plan of a person who had just had a triple bypass. She said, “Honey, it's Friday and everybody eats fried fish on Friday in New Orleans.” On Fridays they eat fried fish, that's just what everybody in this city does. I found myself caught between cultural traditions and what my medical education taught me was a healthy diet. I realized that in order to tackle these things we need a drastically different approach. Where did you find yourself next? I was always singing opera in the background of my studies. So when I decided that the traditional medical model was broken and I was not interested in dedicating my life to what at the time seemed like a fruitless endeavor, I just packed up and went to Europe for seven years and sang opera. I followed my heart to sing in Europe, in NYC, and I eventually ended up in Chicago. I always knew I would return to the medical field, but was unsure in what capacity. When I came back to medicine, I knew the allopathic medical path would not fulfill my heart, so I started investigating naturopathic medicine. I liked what I found and in 2012, began my life as a naturopathic medical student. I can happily say I love what I do. What is it like being a student representative of Integrative Therapeutics? What is the goal? I'm here to be a learning resource - I understand what doctors and students are looking for, and I can be a guide. After I initially reached out to my professors and colleagues with information about Integrative Therapeutics, so many of them contacted me with excited questions about the products. I did a lot of the footwork and research for them. I probably got stopped in the hallways at least five times a day from a student or a professor who wanted more information about our products. They joke with me because my car is like a treasure chest of samples, I have samples for everything, they love it. What's next? What are you doing to prepare for the real world out there? I have a general idea of what kind of practice I want to have. Right now, I am doing a lot of geographic investigation. I travel to as many different states as I can to investigate and decide if my type of practice would fit into the culture. That is what I've been doing--you know that and panicking because I don't want to leave the Integrative Therapeutics family I have. I've been with them for longer than the average student representative, so the thought of not working for them makes me sad. My main interest is female fertility. I like tricky cases. I'm like a little Sherlock Holmes when it comes to figuring out the why of everything - I've been that way forever. There are multiple reasons for infertility, yet traditionally women have just been offered one answer, In Vitro Fertilization (IVF). I hope to change that - not everyone’s healing process has the same answer. More importantly, the particular reward of this type of practice is a joyful outcome. If you do it right, it ends in a joyful occasion: a baby. I love that about fertility. You can change somebody’s health and subsequently bring life to this world and that is a beautiful process. I want my patients to know that I am their advocate and that we are going to work on this project together, and hopefully the end result will be a healthy baby. My mission is to help women achieve their dreams of having a family. Personal Insights is a series of profiles on the people and institutions leading the movement forward, breaking down the barriers between integrative care and everyone who needs it. Integrative Therapeutics is committed to supporting initiatives like residency programs, universities and clinics, because we believe everyone deserves options to choose their ideal path to health and happiness.